Rebs World Famous on Forward website! Wow we’ve made the big time. An old foto from about 4 years ago. Dave Moskovitz, Sue Esterman, and Rainer Thiel – you can check out anytime you like but you can never leave from Hotel Klezmer Rebs. 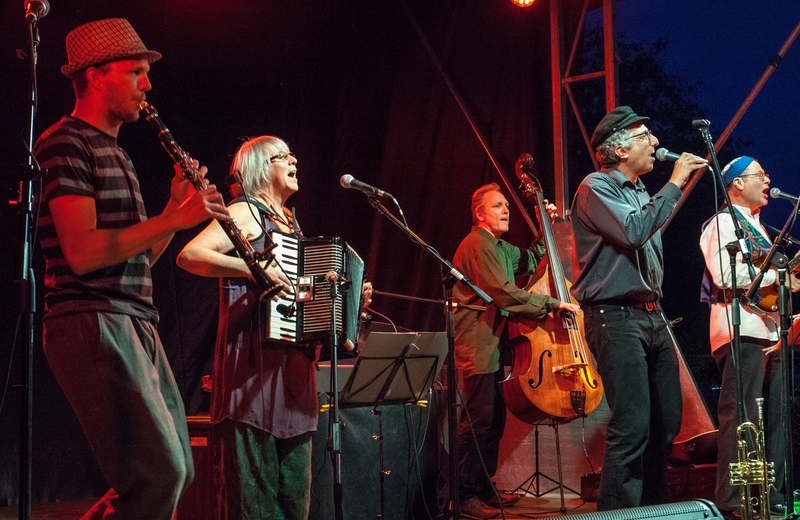 Now how did a little ‘ol amateur klezmer band from little ole Wellington New Zealand get to have our foto used for an article about how klezmer music is live and well? The lord moves in mysterious ways! Thanks Forward! Honoured to be in your legendary publication! 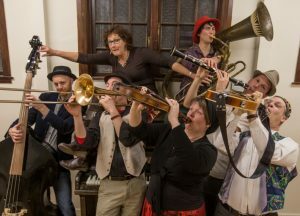 Join the Klezmer Rebs and the Wellington City Shake ‘Em on Downers for a concert to benefit the Israeli volunteers who meet and transport Palestinians for urgent medical treatment. The Road to Recovery fundraiser concert – what is Road to Recovery? 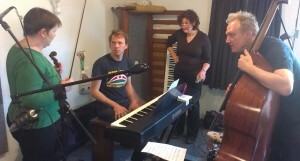 In a special, musical gesture to unity, two local bands, the Wellington City Shake ‘Em On Downers and the Klezmer Rebs, will perform at a benefit concert for the Road to Recovery. Wellingtonian Marilyn Garson worked and lived in the Gaza Strip for four years, 2011 – 2015. She now speaks about her experience. One group of listeners wanted to contribution to solutions, and they wanted the fundraising itself to bring together Kiwis from different backgrounds and politics. Marilyn proposed the Road to Recovery. Three of her colleagues’ families have needed humanitarian diagnosis or treatment in Israel. The bands are donating their time, and the concert organizers hope to find sponsorship for the costs, so that they can donate the full ticket price to the Road to Recovery. Cash sales only at the door. The doors open at 7:30 for an 8:00 start. 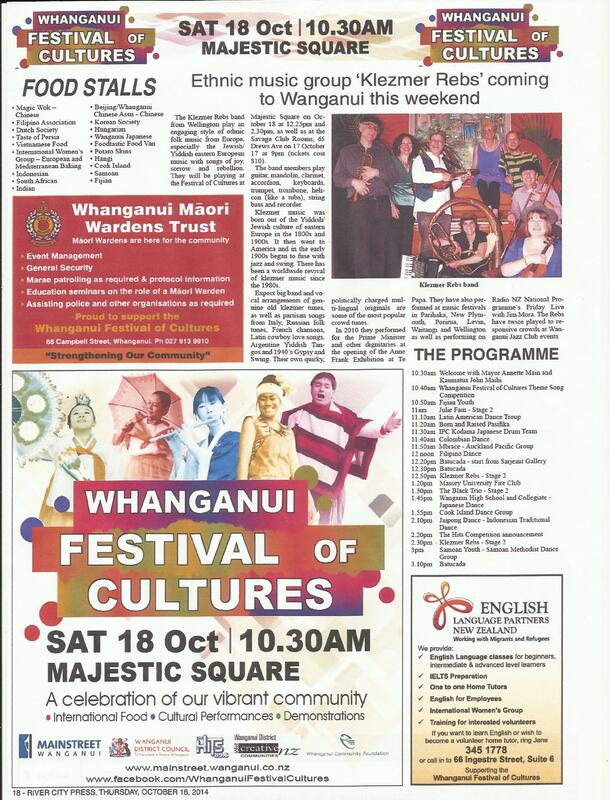 Wellingtonians, are you ready for some klezmania? 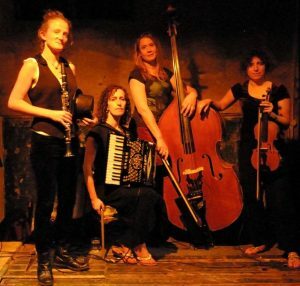 Come see the Klezmer Rebs with overseas guests the London Klezmer Quartet in concert together. 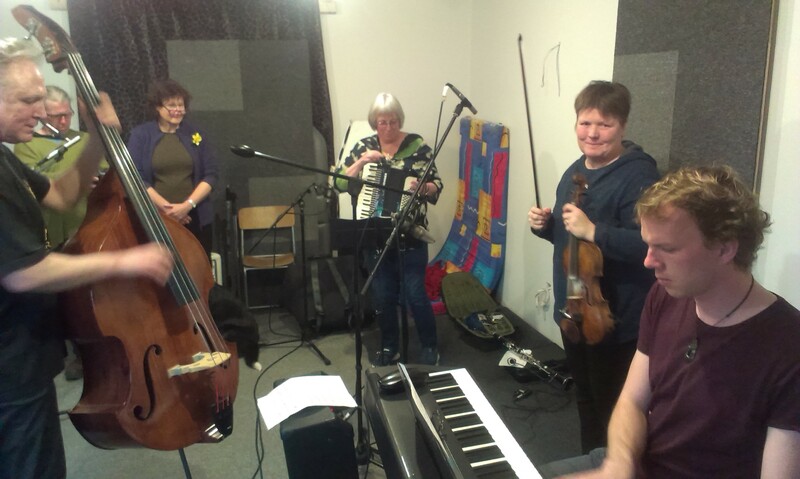 NOTE: the 29 January date is not a concert (to see us in concert, come to one of the gigs on 27 or 28 January) but a workshop featuring demonstrations of the variety of the klezmer repertoire, an opportunity to play klezmer (bring your instrument! ), a chance to learn dances the music was written for, and some background about Yiddishkeit and klezmer culture. Learn and enjoy, while shaking your tuchas! Moonlight (Ladino song) is a stunning 7/8 time signature Ladino/English song – Ladino being the Spanish-sounding language of Sephardi Jews who come from the Iberian Peninsula, North Africa and Arabic countries. Reb Rose sings it beautifully and it features an outstanding solo by our activist/anarchist clarinet player Urs Signer. Also here’s a snippet from the opening track. Josh’s Song for the Rebs is an original written for us by our friend Wellington jazz musician Josh Simon and played with a bit of swing. 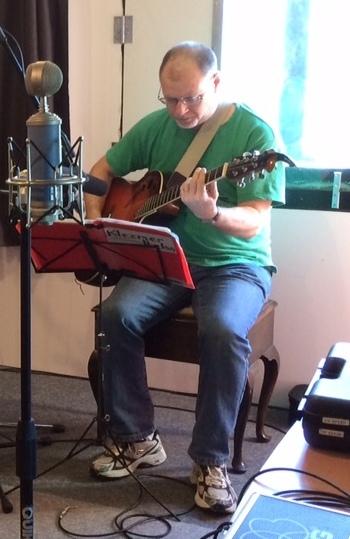 It forms the first part of a medley, but you’ll have to get the CD to hear it all. The Klezmer Rebs ethnic music band return for the fourth (and sadly, the last as Bent Horseshoe will be closing soon) time to the wonderful Tokomaru venue the Bent Horseshoe on Saturday 30 May. Urs Signer our wild Swiss/Kiwi clarinet player will join us when we play a range of slice-of-life Yiddish klezmer story songs about the ‘old country’. You will also enjoy partisan songs from Italy, Russian folk tunes, French chansons, Latin cowboy love songs, Roma / gypsy jams, and English language jazz and 1940s swing vocal songs. Their own quirky, politically charged multi-lingual originals are some of the most popular crowd tunes. 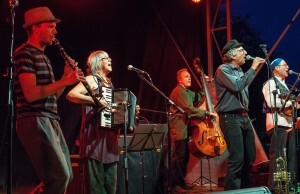 The Klezmer Rebs have been shaking ‘tuchases’ in Wellington and places north since 2002, recently wowing crowds in Whanganui and Palmerston North’s Culture Festivals. Tickets are $20 for two sets of music and enjoy the wonderful intimate ambiance of the ‘Shoe café before Steve gets put out to pasture with the local bovines. 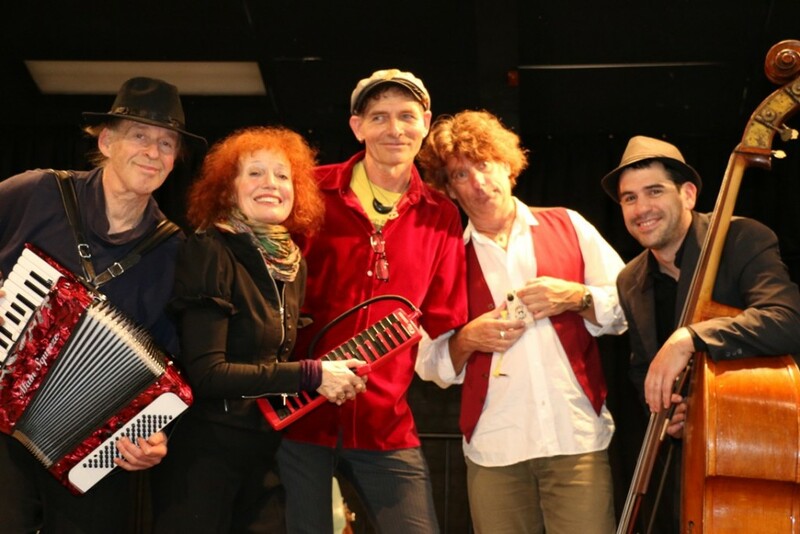 After a 7 year absence from Wellington the fabulous and wacky Jews Brothers Band will be finally performing in Wellington again, with Yiddish cousins the Klezmer Rebs in support. The Jews Brothers will close their 20th anniversary national tour on Thursday 7 May at Newtown Community and Cultural Centre playing a batch of new songs from their just-recorded CD Up in the Borscht Belt. The Jews Brothers Band (JBB) are an all-star band featuring founder and leader, Hershal Hersher on accordion, ace picker Nigel Gavin on mandolin and guitar, Peter Scott on double bass, one-armed saxophonist and percussionist Neill Duncan (ex Six Volts and the Spines) and chanteuse extraordinaire Linn Lorkin on lead vocals and melodica (Linn’s song Family at the Beach was voted Best Kiwi Summer Song in a recent New Zealand Radio Listeners’ Poll). JBB created a sensation when it first hit the local scene in early 1995. What was this sound? And what was this ‘klezmer’ they were playing? For Brooklyn raised founder and bandleader Hershal, this music was a return to his roots, to the music brought to New York by the Eastern European Jews. JBB’s wild, toe-tapping, hand-clapping repertoire soon had audiences circle-dancing or bopping to the grooves of the ‘best swing band in the land’. Expect also gypsy ‘hot-club’, schmaltzy waltzes and daring vocal harmonies on this 20th anniversary tour of a very special band. For more on Neill’s courageous story of coming back from losing an arm to cancer, see below. Neill is keen to be back on home turf to show his old Wellington mates his chops on his custom made one-handed sax. Tickets $30 / $20 unwaged Door sales if seats available. BOOKINGS ESSENTIAL Just 40 seats left. For bookings email david.weinstein@klezmer.co.nz This concert is sure to sell out in the intimate Newtown Community Centre Theatre so book early to avoid disappointment. Catch RNZ’s DJ Ryan who will be playing a couple of tracks from the Rebs’ CD Anarchia Total on Sound Lounge on RNZ Concert Tuesday night 14 October from around 7pm. online by going to RNZ’s home page http://www.radionz.co.nz/concert and clicking on the Listen Live link at the top of the screen. Come along in the Square on Saturday 18/10 during the Cultures Festival and/or catch a full concert for just $10 at Savage Club Rooms on Friday 17/10. Guaranteed to get your tuchases shaking.